Chelsea walked into Cherrygrove with Ganny following closely behiond. Ganny's level has gone up from the training they did on route 29. Chelsea was about to make her way right through the town when a random old man approached her. "Hey! hey! " and then he ran away. "odd people" she said, just as the old man came back. "would you like a tour of the town?" Chelsea was shaking her head as a no, but when she opened her eyes, she saw the old man walkign away with Ganny. It looked as though the two were having a conversation. Chelsea ruched to the two. "Ah yes. that is the mart." "Thats the pokemon center. you can heal up there." "piiiiii...." Ganny rubbed her chin. Esther walked and just entered Cherrygrove. "HEY ANOTHER YOUNG LAD!!! "The Old Man Said "Follow Me I'll Give You A Tour!" After that gruesome tour the Oldman gave Estehr A Map App for his Pokegear and some running shoes. "Ohai!!! "Said some guy"You ran away before i could show you how to catch a Pokemon!" NarutoHeartGold wrote: ran off back to prof elm where he bumped into Green. After Green caught Aipom he went to Professor Elm's Lab. "Hey Elm, I just spoke with my grandpa about the Quest to finish the pokedex. I also told him to give a pokedex to Gold. Did he come by yet?" Green asked just as Gold ran in holding an Egg. "Gold! What took you so long, I looked in Cherrygrove and Mr. Pokemon's looking for you" Green said walking up to Gold. "I just caught an Aipom, it stole my pokedex..." Green said waiting for a response. "Well Green,after getting the running shoes from the old guy i decided to try them out so i ran around the city awhile hehe aint that crazy.Oh look here my explotaro evolved into a quilava and my pidgtaro evolved into a pidgetto. I also caught a sentret and a spinark,Hmm i running low on pokeballs i better go buy some more or i forgot i got this cool egg from mr pokemon and the pokedex. "Gold showed green the egg and green looked at it in amazement." Alice looked around. She and Togepi had just gotten out of Sprout Tower. She was unsure where to go, so Alice walked to the Pokemon Center, with Togepi in arms. Grayson awakes to the glaring sun through the shades. He notices that squirtle is not in the room. He then walks out onto the deck to find squirtle diving up and down with the boat playing with a wild Horsea. "HI HO!" screamed Murray from the steering wheel of the boat. "Good morning." Said Murray to Grayson as he stepped up to Murray's level. Grayson looks at Squirtle. "Hes been doing that for about an hour" Said Murray "He met that Horsea back the last island". Squirlte notices Grayson and Jumps up to the boat with the Horsea. "Hey there Squirtle, is this your new friend?" Asked Grayson "Squirtle, Squirt!" said Squirtle nodding. "Well then i guess theres only one thing to do" said Grayson while bringing out an empty PokeBall. "GO POKEBALL!" Grayson threw the ball at Horsea. *Wiggle Wiggle* *Wiggle Wiggle* The PokeBall stopped... *Tschhhhhhhh* the ball opened and the Horsea fled. Squirtles and Graysons head dropped in disapointment. "You need to weaken the Pokemon before you catch it" stated Murray. Grayson watched the horozine and noticed their destination, Cianwood City. Chelsea was walking along route 30 when she spotted a young boy sprinting 'for his life'. she ran after him since she had her new running shoes on, and Ganny trailed behind. Chelsea looked at the boy as he panted. "Er.. what were you running from, exactly?" After training her Pokemon a bit, Alice decided to test her luck in the Gym. So she decided to look around the city. She found a school and a lot of houses. There was also Sprout Tower. and uh...that Ruins of Alph thing that gave her Togepi ominous vibes. NarutoHeartGold wrote: Gold showed green the egg and green looked at it in amazement." "Wow, I haven't seen a pokemon egg before" Green said looking at the egg's triangle shapes. "Charmer, PomPom go look at the egg for yourselves" Green said tossing his pokeballs outward while Professor Elm was looking at the egg as well. "Welcome back Gold, I see you got a Pokedex from Professor Oak. And you got the Mysterious Egg from Mr. Pokemon" Elm said when his pokegear rang "Hello? Yeah. Can't make it. Maybe Gold and Green can take my place? My Assistants. Okay. Goodbye" Elm hung up the call and turn towards Gold and Green. "A buddy of mine who is an archeologist has discovered mysterious things going on in the Ruins of Alph, Since I can't make it will you go and investigate for me?" Elm asked. Charmer stared at the blue/red traingle shapes on the egg thinking if it could be a Charmander egg. PomPom suddenly took Gold's hat and ran outside, Green replied to Elm's Request "You can count on us, right Gold?" but forgot he went chasing after PomPom. Gold is runs after PomPom and say's "Come here u monkey and give me back that hat!!" PomPom taunts Gold and goes "Poooom! " Gold gets angry and sends out explotaro. Gold said explotaro "Flamethrower now!!" PomPom was hit with the flamethrower and was knocked out. Gold took his hat and looked on Green and said "Wow sorry didnt think i would KO it hehe but this is one playful PomPom i want one too can u help me find one "
"Uh... Return?" Green said holding the pokeball. "Sure Gold we can try to find another Aipom, they are usually in trees. Or causing mischief like taking food" Green said when Charmer tugged on his pant leg "Yeah that reminds me, we are on another mission for Elm but this time to the Ruins of Alph" Green said to Gold. "Come on let's finally start our adventure!" Green said "Return!" Green said to Charmer. "Gold first we're going to heal our pokemon at Cherrygrove, then to Violet City, than the Ruins of Alph!" Green said before noticing Elm standing behind him "Actually you can heal your pokemon here, that way you're there much faster" Elm said. "PomPom come on out" Green said sending out Aipom. The playful Aipom poped out the pokeball and spotted Quilava, than ran around with explotaro playing tag "Gold let's finally go start our adventure, to Violet Town!" Green said as PomPom jumped onto his head. Gold happily said "Alrite i heard they have a gym there lets challenge it too hehe" Green said "Sure but i might need to train and catch some more pokemon." Gold said "OK while i look for an aipom on the journey you can catch some and train also. Onwards to violet city!!!!!!!!!" Alice decided to buy some food from the Poke Mart, as well as stock up on supplies, as she ran rather low. The Sprout Tower monks were nice enough to give her some money when she beat them all ((by using godmode)), so she used the money to buy five more Poke Balls, three Super Potions, three Escape Ropes, two Heal Balls, two Repels, and one Parlyz Heal, as well as a hamburger, some fries, some water, and Pokemon food. Alice sat on the side of the road, watching her Pokemon enjoy their food as she ate her own. Green and Gold were walking along Route 30 when somebody came out of their house "No kids, I'm not Mr. Pokemon for the last time. Please stop asking" Green and Gold looked at each other in confusion "Sir, we didn't say you are Mr. Pokemon" Green said. "Really? Finally! Some kids believe I am not Mr. Pokemon, here take this Apricorn Box" the nice man said handing Green the box "Thanks" Green said looking at a Pink Apricorn near his house. Green walked up to the bush and took the Pink Apricorn and put it in the Pink section. "Gold, we can both use the Apricorns and Pokegear. But I'll hold onto the Box, understood?" Green asked Gold who kept looking in trees at random for a wild Aipom. "Nice work you two. Keep it up!" Charlie had his two Pokémon battling eachother, but let them do the work. This let Charlie see the way his Pokémon prefered to work, meaning he could try and work around it in battle. it was obvious from the start that Gyarados loved all out attacking, and trying to take his opponent by surprise. Aqua on the other hand, prefered darting around, avoiding hits from his opponent, before landing an attack. A few hours of hard work later, Charlie recalled both of them, and took them to the Pokémon Centre. He decided now was a good time to head to the lighthouse, but as he left the Pokémon Centre, he spotted a jellyfish in the water. "Wait a second....That's a Tentacool! I've gotta catch it! Okay, Aqua let's go!" Aqua ran forwards towards the Tentacool, which had only just registered it had been spotted. Aqua charged forwards, readying his attack. The Tentacool sat there in the water, waiting for Aqua to approach. Suddenly, just as Aqua was about to launch his attack, the Tentacool launched a blob of acid at Aqua. Aqua didn't have enough time to dodge the attack, but the acid completely missed. It seemed the Tentacool's aim was very low, and Aqua's attack hit it square on. "Tenta!" The Tentacool didn't seem to be able to take a hit very well, but Charlie wanted it anyway, and threw a Pokéball. He waited, but the resounding ping came very quickly. Aqua grabbed the Pokéball in his teeth, and took it back to Charlie. "It probably has low health, I better get it back to the Pokémon Centre," Charlie muttered, before returning Aqua and running back inside. Gold said un-attemptively to Green "Uh huh. Oh Aitaro where are you?" Green looked at Gold and said "Aitaro??" Gold looked and Green and said thats what i am going to call it when i an aipom." Green looked at Gold and said "Does everything have to be Taro for you." Gold Said "Yes!" Green just looked at Gold and laughed. NarutoHeartGold wrote: "Does everything have to be Taro for you." Gold Said "Yes!" Green just looked at Gold and laughed. Green walked around while Gold went looking for Aitaro. Green spotted a Ledyba Flying over head, "PomPom used Scratch!" Green said while PomPom Jumped off his head and scratched the bug pokemon. Angered by what just happened Ledyba used Confuse Ray "Pom, Aip" PomPom said walking around with swirled eyes "Return! Go Charmer, use Ember!" Green said switching pokemon. "Char Char" Charmer said before bellowing a small ember. Ledyba was hit (about 1/3 HP left) and came after Green with a Comet Punch. Green dodged rolled to the left and grabbed an empty pokeball "Go Pokeball" he said giving it a curve. Once, Twice, Pop. "Ledyba!" Ledyba said angrily, "Charmer scratch!" Green said running around to avoid more punches. Charmer scratched the Ledyba but got Tackled in the process "Return!" Green said once more. "Don't fail me now" Green said throwing one more pokeball. Ledyba was sucked in a red beam. "Hey Gold, I just caught a messanger for our adventures" Green said smiling. 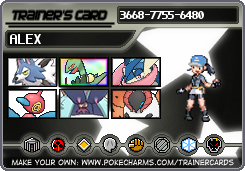 After Alice's Pokemon finished eating, she traveled to the Trainer School and studied up on Pokemon raising and battling, as well as how to determine status and various treatment options. Alice left after gaining a substantial amount of knowledge, and decided to train in the grass near Violet City. Green and Gold had made it to Route 31, where Green battled a trainer. Green also picked a Black Apricorn. Green trained his pokemon some levels while Gold searched the trees for Aipom while holding the Egg, "Aitaro! Aitaro are you here?" Gold shouted while Quilava ran around and played with Charmer. "PomPom Scratch that Pidgey!" Green said fighting some random pokemon to battle and level up his team. PomPom defeated the Pidgey and leveled up "Hmm according to the Pokedex PomPom is level 12 while Charmer is level 14" Green said. Gold than yelled "PomPom not my hat again!" Green looked at PomPom who was standing on it's tail next to Charmer showing how tall it was. "Gold, that's not PomPom. PomPom is right here see?" Green said to the confused trainer."Huh?" Gold said looking at PomPom than the h Aipom whom stole his hat "That means... Aitaro!" Gold said "Green hold the Egg while I get my hat and capture Aitaro" he said handing Green the Egg. "Come one Explorato!" Gold said running off chasing Aitaro towards Violet City. "Gold wait up! Come on PomPom and Charmer" Green said running towards Violet City while Green made sure to not drop the Egg. During a break, Alice noticed an Aipom eating some of her snack. Rattata impulsively Quick Attack'd it, causing it to stagger just in time for the two boys that were chasing it to come across it. Gold ran quickly after the aipom "Oi,Aitaro give me back my hat and come into my pokeball!" The Aitaro puts the cap on his head and does 4 summersaults. Gold looked in amazement and said "WOW its even more playful that Green's own i have to catch it,Explotaro Flamethrower!" The aipom dogded the flamethrower and used swift that made a critical hit on explotaro. Green was behind Gold saying "Wait up Gold you can't make such a commotion through the town people might get hurt." Gold got a serious look on his face and said "Green your right i will rap this up now." "Explotaro spin and use swift" This made the like a ball of stars spreading and getting closer to Aipom,Aipom was hit from the swift and fell to ground. Gold said im not done yet "Flamethrower lets go!" Flamethrower hit th aipom. "Alright your mine,Pokeball GO!" The Pokeball shakes once,twice....Ping. Gold and Green jumped for joy. The bidoof fel down hard. ((Hey, I thought Gold and Green were headed towards Alice's spot. Thanks for circumnavigating that, NHG. Alice cried as she was neglected ((BECAUSE OF YOU ;_ ); her Pokemon comforted her and she decided to trek into the Ruins of Alph. Gold wrote: Gold and Green jumped for joy. Green was happy that they finally made it to Violet City and jumped around while still holding the egg with Charmer and PomPom, "Finally here! Now to heal our pokemon at the pokecenter!" Green said while Gold jumped for Joy and forgot gravity existed and hurt himself. "Gold... let's go to the pokecenter" Green said still carrying the egg towards the center. Green and Gold walked to the pokecenter and healed their pokemon and got out. "Gold should we go train for the Gym by going to the Sprout Tower?" Green asked "Yeah" Gold said ready for all these battles. "Welcome to Sprout Tower" a Monk said "You see that pillar? Legend says that was a bellsprout over 100 feet tall." the Monk said again. "Cool, now excuse me sir" Green said trying to walk by the monk with the egg still but was blocked "Kid, where do you think you're going?" the monk asked. "Sir I'm trying to reach the top of this tower to battle the Elder Monk" Green said. The monk started laughing than grabbed a pokeball and said "You'll have to defeat every single one of us before he thinks you're even worthy to battle him" Green sent out Charmer and said "Bring it on!" while still holding the egg.